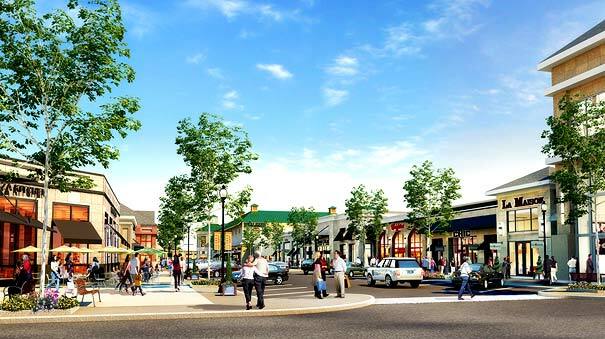 Much to no one’s surprise, W/S Development’s bizarrely ambitious plans to build a lifestyle center with several million square feet of space in Hudson, New Hampshire, were canceled this week. We wrote about this plan a couple months back, and said that it would basically spell a Mr. Yuk for the completely successful (and completely fine) Pheasant Lane Mall just a mile or so away. Apparently now W/S Development is teaming up with New England Development (the firm run by Steven Karp, who is responsible for building many of New England’s most powerful shopping malls in the ’80s and ’90s before selling most to Simon) to build a much smaller lifestyle center, Nashua Landing (pictured above), in Nashua. They say “competition for the most desirable retail stores” was at the heart of the decision, a big “no kidding!” statement if there ever was one. “Charles Y. Lazarus, whose family name stood for department-store shopping in Columbus and much of the Midwest for more than a century, died this morning. He was 93.Known to friends and associates as “Mr. Charles,” he was the last family member to run the Lazarus department store chain, which started in 1851 as a one-room men’s clothing store on S. High Street and grew to more than 40 stores in five states. “The Lazarus name was removed from stores in 2005 by corporate parent Federated Department Stores and replaced with Macy’s. “The Lazarus family of Columbus was instrumental in founding Federated during the Great Depression along with Abraham & Straus of Brooklyn, Filene’s of Boston and Bloomingdale’s of New York City.” Read more. The aging Latham Circle Mall, featured on this site in February, is going to be extensively renovated beginning this summer. While the Albany-area mall will not be fully disenclosed, much of its focus will be turned back outside, including the addition of an outdoor courtyard in the center of the existing mall, which will feature al fresco dining. The existing food court will also become a new anchor store. A large feature in the Boston Globe today discusses the Patriot Place retail development in Foxborough, Massachusetts, on the site of Gillette Stadium, home of the New England Patriots. The Patriots are the only major New England sports team whose stadium is located (well) outside of Boston, and owners Robert and Jonathan Kraft are building a 1.3 million square-foot retail and entertainment complex around the existing stadium. The Globe article also includes a 3D rendering of the project as well as an artist’s rendering, plus video of the construction. The project, known as Patriot Place, has 1.3 million square feet, anchored by powerhouse merchants such as outdoor retailer Bass Pro Shops. Other major attractions include a Patriots museum, a sports medicine and healthcare clinic, a 500-seat jazz club, and a high-end movie theater with reserved seating and concierge service. The first phase is set to open this fall as the football season and holiday shopping season are in full swing. Christmas Tree Shops and Victoria’s Secret are two of the first confirmed tenants. Also, are we talking about the same Charles Lazarus of Toys R Us? I don’t think so… I think this is the Charles Lazarus of Lazarus Dept Stores, who later became Federated. The Lazarus banner was finally retired in 2005, at the same time as the Rich’s banner in Georgia, about a year before all the May banners were nixed. Thanks so much for this retail update, Caldor. It’s a shame that Charles Lazarus had to witness Federated’s decimation of the Lazarus name. Regarding the floundering sales at the former Marshall Field’s flagship store, it’s laughable (although not at all surprising) that Federated fails to admit the real reason as to why the store is doing poorly: the name change. In actuality, it would have made much more business sense to have kept the Marshall Field’s name around for (at least) just that one location: If that had happened, the State Street store would still have served as a huge tourist trap. Plus, the costs of keeping the name around for just one location would have been so immaterial for a large company like Federated. Also, I believe the The Bon-Ton should have waited another year before closing Carson Pirie Scott’s flagship store. While it’s true that (according to The Bon-Ton) the flagship store was the worst performing store in the entire chain, keeping the store open for just another year would have been worth it to see if sales could increase significantly as a result of all the anti-Macy’s sentiment in Chicago. As for the Macy’s flagship doing badly, what are they expecting? I do wonder how it’s doing in Chicago overall, or if it’s just the flagship that’s languishing. The Macy’s “conversion” has involved putting new signs up, and that’s about it (remember when K-Mart put “Big” in front of their signs?). And I’m sure whatever they saved beancounting the advertising has been completely lost trashing whatever was left of shopper loyalty. Mix in the complete lack of consistency in Macy’s stores (ranging from nice to completely trashed (Northlake Mall, Atlanta GA, where I kid you not they have fake chrome hubcaps tacked to the walls in the men’s department)) . As a die-hard Patriots fan who has made the pilgrimage to Foxboro (8 hours drive one-way) each of the last 4 years, this shopping mall development is of interest to me. There is barely anything of interest on the route 1 corridor in the area (save some industrial buildings and a few dumpy motels). Driving a few miles north you get to the Walpole Mall, which isn’t much to write home about. Latham Circle Mall….I wonder, if in the renovation, they’ll add an interior entrance to the Lowes, as well as interior entrances to the restaurants. It would be cool if they also changed the ceiling heights. As for Riverplace, the canned lifestyle center, it makes me wonder if they were thinking of taking Pheasant Lane and adding “lifestyle elements” to it, too. A mall entrance for Lowe’s? Seems very unlikely. Then again, it was odd enough for Lowe’s for anchor a mall – a dying one at that. If anything Lowe’s will seek to detach from the indoor portions. Caldor, I apologize so much for my rudeness in bringing this up. However, yesterday I posted a comment on this thread that was blocked by the spam blocker. I also tried to post a message to alert you to this problem, but the spam blocker blocked that, too. If it’s not too much trouble, could you please find my initial post and post it here? I apologize for all of the inconvenience this may cause you. Caldor, thanks so much for finding my blocked comment and posting it here.